San Diego Zest Women, which will be competing its inaugural season in WPSL this summer, announced Wednesday its affiliation with Japanese club AC Nagano Parceiro Ladies, which currently competes in Japan’s women’s first division. With the affiliation, the team will be renamed from San Diego Zest Women to San Diego Parceiro Ladies. 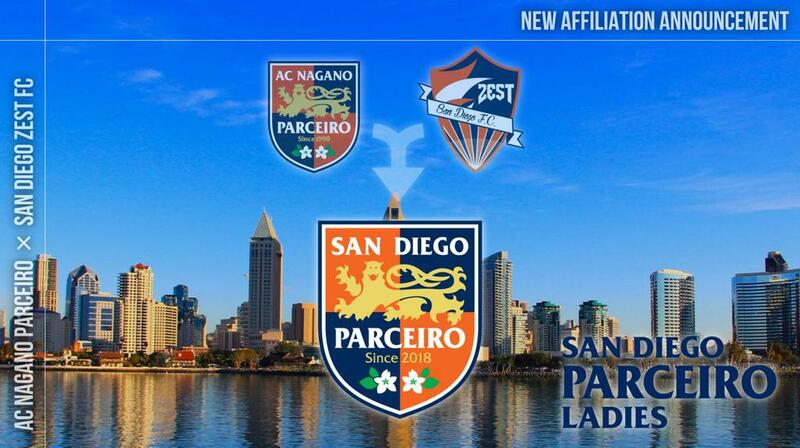 “We are so proud of our new affiliation with AC Nagano Parceiro," San Diego Parceiro Ladies owner Chase Yamauchi said. "We have successfully connected our men’s team to the world by owning a Montenegrin third division club and by inviting an Argentina club to our upcoming pro combine. Now it’s time to expose our women’s team to the world. AC Nagano Parceiro Ladies was established in 2000. The team is owned by AC Nagano Parceiro, which competes in Japan’s men's third division, J3 League. Former Parceiro Ladies player, Kumi Yokohama, has been selected for Japan’s national team squad since 2015 and currently plays for FFC Frankfurt, which competes in the the first division of Women’s Bundesliga.